You’re an adventurer. You like to explore. You like going places where there are no road signs, and your vehicle is an extension of your personality. You want a car that’s built to last, can go anywhere, has an international award-winning engine and that has an impeccable interior with the latest features. If that sounds like you, you are going to love the all-new Volkswagen Alltrack, available now at Volkswagen of Kamloops. Volkswagen has listened to the scores of people who want an all-wheel drive vehicle, but don’t like the SUV price tag or the fuel economy that goes along with it. 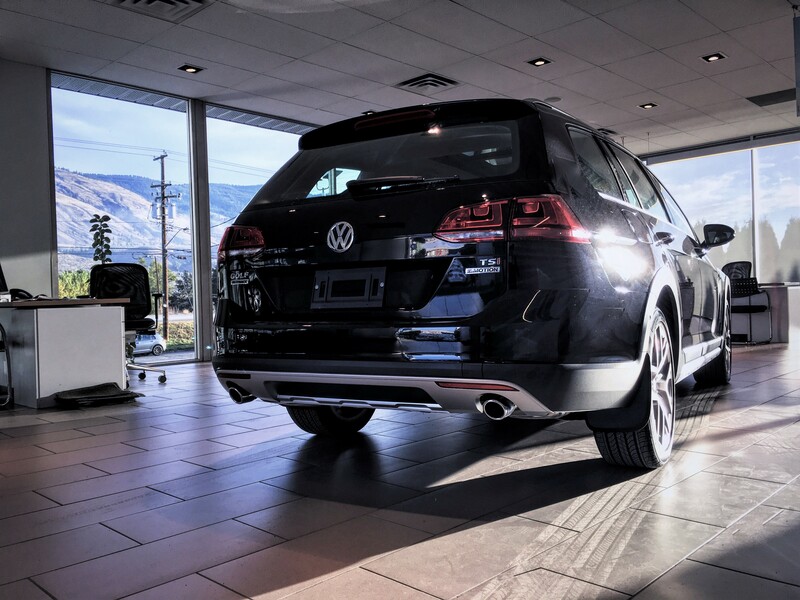 The Alltrack is based on the wildly popular MK7 Golf Sportwagen platform and it blends it with rugged off-road capability on the exterior as well as an extremely-refined interior. At first glance Volkswagen has given the Alltrack off-road styling and protection where it counts, but its upscale aesthetics will also turn heads as it drives through town. The exclusive 18” Canyon alloy wheels will be one of the first things to stand out to most, while the aluminum trim and accents really give the Alltrack an overall premium look and feel. With a 6.9” ground clearance, the Alltrack gives you enough room to clear most obstacles when you decide to take the unbeaten trail. The lower body and wheel arches are complimented with dark cladding to protect the vehicle even further. Volkswagen has also put additional protection under the vehicle. Up top, the Alltrack also comes standard with aluminum roof rails and a panoramic sunroof that is over 12 square feet. With the light and sound package, drivers will also be treated to bi-xenon headlights. Make no mistake, the Alltrack is a truly premium model and it has one of the classiest and feature-rich interiors that you will find across the VW lineup. The full-leather interior comes in either full black or Vienna leather. The 12-way power adjustable driver’s seat seats you comfortably in the spacious cabin that is absolutely loaded with features and technology. The 6.3” screen provides you with a multitude of entertainment options including Apple Car Play and Android Auto, and it is flanked by a cool grey backdrop which does a great job of subtly accenting the rest of the interior. Voice-guided navigation comes standard, and the ability to change your driving mode – from normal, sport or off-road, is at your fingertips. The rearview camera is nicely hidden underneath the VW emblem which flips up when you shift the car into reverse, which prevents it from getting dirty and obstructed from mud, rain and snow. For those chilly winter days when you’re headed up to the mountains, both front seats offer three-way heated seats which also provide warmth up your back. Dual-zone climate control and rear vents keep you warm or cool no matter the weather, and the back seats offer plenty of space and seats three comfortably for long drives. Of course, when looking at any wagon, interior and cargo space are big factors. Even with the back seats up, the Alltrack boats 30.4 cubic feet of cargo space. With the rear 60/40 rear fold down seats and middle pass through, that cargo space increases to 57 cubic feet, which is larger than a Honda CR-V.
Powering the Alltrack is the turbo-charged 1.8L TSI engine, which pumps out 170hp and 199 lb-ft of torque. It is mated to a six-speed DSG transmission, which is the fastest automatic transmission on the market. The seamless shifting provides for an even smoother driving experience. Fuel efficiency is rated at 10.6 L/100 km and a highway rating of 8.0 L/100 km, and the Alltrack features a fifth generation Haldex all-wheel drive system. This system can send 50 percent of the power to the rear wheels at any given time, and on the highway it operates at a 90/10 front to back bias to save you on fuel when all-wheel drive isn’t necessary. A version of the XDS-Cross Differential system originally developed for the GTI helps controls wheel slip. The system essentially acts like a virtual mechanical limited-slip diff, pushing power to the slipping wheels individually through intelligent brake application. All of this comes without the driver having to think about anything or touch a button. If the Alltrack is slightly out of your budget, you’re still in luck if you want a wagon with 4MOTION. Volkswagen is also releasing 4MOTION versions of their regular sportwagens, available from as low as $30,000. If you would like to schedule a test drive in an Alltrack, click here to talk to our sales team and see how easily you could get into one of the most highly anticipated Volkswagens in years.